The Financial Meltdown – Origins, Participants and Why it was waiting to happen? I have been having many a round of discussions with my friends, Aman and Nitin, on this topic. I, with finance background, end up having the task of explaining of what caused this. It’s those endless discussions, leaving our spouses frowning, which forced me to write this blog. Attempt has been to put together in a layman’s language on various aspects of this economic seizure or financial tsunami, popularly called these days. We will stray here and there to understand various concepts as it comes along. Any economist worth his salt probably knew that recession was on its way. What probably they couldn’t figure out was the depth of malaise and consequent magnitude of seizure, leading to collapse of global economies. But what intrigues me is only very few had the guts to take a position and write about it convincingly, against the popular public opinion, while it was sunshine. History has it that public opinion is based on ‘expectations and euphoria’ and not on facts and it’s the duty of the academics ( in older days philosophers did it ) to pen truth based on insights through scientific research and data and not get swayed by popular opinion. Majorities have disappointed, but some of them didn’t succumb to populist thoughts. The most notable of them is Mr. Paul Krugman, the popular New York Times columnist, Professor of Economics and International Affairs at Princeton University and this year’s winner of The Sveriges Riksbank Prize in Economic Sciences ( in memory of Alfred Nobel ), popularly known as the Nobel Prize. Though he won Nobel for his seminal work ‘analysis on trade patterns and locations of economic activity’, it’s his writings in NYT, which were sharp, incisive and blunt in his predictions about this impending collapse and consequences thereon which got him accolades within masses and peer group. Publications like The Economist in their book, ‘Economics – Making sense of the Modern Economy’ by Simon Cox, also talks about the lopsided economy and detail the phoney nature of the bullishness seen around, why it would be short-lived and why the recession this time could be long, deep and painful. Though all economic activities are interconnected and therefore roots of any economic cycle of boom and bust can be traced back in history as far as we want to go. No point going back to Great Depression of the 1920’s. Let me take the collapse of the US stock market in 2000-01 as the starting point. The 2000-01 collapse was mainly led by ‘tech-bubble’. The US government and Fed responded by monetary and fiscal interventions cutting interest rates and slashing taxes respectively. Not surprising, because this is what everyone does or is expected to do. This is what we, in India, are currently doing. Rather all central banks and governments are doing. That did work in 2000-01. The recession was shallow and short-lived. By cutting interest rates and slashing taxes, extra money was made available, but this was not earned i.e. wealth was not created. People continued spending (or consuming) and economy did shore up. It’s important to remember that this spending was not on account of increased pay or increased saving but extra dollars made available by tax cuts and borrowings. An economy bouncing on these measures essentially postpones the problem, doesn’t solve it. So this recession was pushed forward. Obviously recessions do purge rottenness and increase efficiencies and productivity; this was not allowed to happen. Hence a nastier one had to happen – when, can’t be predicted exactly? One can always argue that it is easier to say this in hindsight, but it is tough to predict whether the recession would be shallow or deeper? So we have economists on both sides – one who are happy about interventions and applaud the steps and other who think that it’s better to have deep but short lived recession rather than no at all, as it brings things in order. An economy should be spending on savings. But US was saving less and less, people felt comfort in rising stock prices 1990s and resultant wealth generation. Cut in interest rates and prolonged period of low interest rates resulted in increased credit availability to consumers (and industrialists). Increasingly debt also gained acceptance within consumers. More and more started availing it - credit cards, auto, personal loans, housing etc. . Cheap credit availability led to a borrowing-driven boom. Fundamentally boom should ride on the back of increased savings and not borrowings. Increased credit availability, leading to increased borrowings and increased spending resulted in increased demand which in turn resulted in asset prices going northwards. One such asset class was housing and other was stocks, which then had rebounded partially and were at their peaks. Housing prices started building up and together with high stock prices made people feel wealthier. That led higher spending and borrowings (and larger borrowings taking out cash from increased asset prices). The cycle started assuming alarming proportions. Everyone started owning increasingly expensive houses in relation to their income. Finance companies became laxer and structured ways to channelize credit flow to all – even the weakest in the credit chain. New ways to lend to sub-prime, NINJA, Alt A and other forms of adjustable-rate mortgages were devised. Credit checks, income verification, collateral verifications were done away with. Obviously they assumed rising housing prices to be the mitigant (underlying assumption). Bumper demand led to a rapid and steep rise in prices. Houses were now overvalued by 30%-45%. This was not the case of US alone; it was happening the world over – US, UK, ANZ, France etc. India too had seen sharp rise in housing prices. In places like Gurgaon houses over 75 Lacs to couple of Crores were coming up everywhere. So much so that The Times of India wrote an obituary of a Crore, an article written over demise of Rs 1 Crore. The housing price rise would have been even steeper had it not been Mr. Y V. Reddy’s (the then RBI Governor) timely intervention restricting flow of money to RE developers. Obviously credit was available to industrialists as well. So expansion plans were put in place. M&As and Leveraged transactions (meaning lot of debt on back of small equity or cash flow) were back in vogue. Corporate borrowings increased, however they were still in check and better off than consumers. They did hold themselves back. It’s only the financial institutions (both banks and investment banks) which went berserk in terms of extending credit against housing, credit cards, and leveraged transactions. As banks went on with their lending spree, especially consumer loans (imagine all sorts of loans – personal loans, auto loans, housing loans, credit cards, equipment leases, student loans etc. ), two things started to happen; 1. Banks required more and more capital to lend and were strapped as deposit mobilization was not enough (infact it had slowed down from existing levels) to meet growth momentum and 2. they started running huge credit risks. That’s where exotic instruments came to play. Everyone has by now heard or read about Securitization, Collateral Debt Obligations (CDOs), Structured Investment Vehicles (SIVs), Mortgage Backed Securities (MBS) etc. and their multiple variants depending on underlying collateral. They are all conceptually the same. Differences are minor; hence I will take you through the basic concept. Well nature of securitization has undergone many changes due to ever changing laws. So I will talk about the nature of securitization prevailing then. In initial days originator (bank) used to keep a loan till maturity on books. Not any more. Now it pools the asset (lets pick up one asset class and then continually use it throughout, so let it be mortgages) and sells it to a freshly created Special Purpose Vehicle (SPV). Sometimes it sells to a third party (another bank or financial institution, investment banks or even government institutions, for eg. Fannie Mae). These 3rd parties then sell it to an SPV . This helps both the originator and the investor as it creates a bankruptcy remote structure, meaning under event of default it’s the SPV which will bear the losses and not the 3rd party and in case originator goes bankrupt, investor's stream is protected. The SPV then issues securities (or bonds) backed by payment rights/receivable pool to investors (could be another bank, debt mutual funds, pension funds, hedge funds etc.). Since in this example the bonds are backed by stream of mortgage payments, they are called Mortgage Backed Securities (MBS), generically it can be called Asset Backed Securities ( ABS). This process of sale and creation of securities as described above is called securitization. 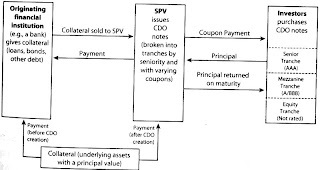 A sample cash flow diagram of a sample CDO is shown ( courtesy : Credit Derivatives, George Chacko and others, Wharton School Publishing). It doesn’t end here. Investors further bundle payment rights and issue securities and this continues over and over again. The final buyer may be 4 to 5 layers down. It doesn’t even end here. The big buyers of these securities then bundle many such securities (say many MBS’s), create a pool and securitize that. These securities or bonds, which in themselves are backed by bonds, are called collateralized debt obligations (CDO). If they are backed by bank loan receivables, it’s called collateral loan obligation (CLO) and so on. Many more complexities have been introduced but essence remains the same. They are all pass through. Structured Investment Vehicles (SIVs) are similar to CDOs, except that they even bundle CDOs and further issue securities, which generally are of shorter tenure (one form could be commercial paper). They try to make money on arbitrage of interest rates between short-term, highly rated paper, they issue and long term underlying paper. They are also referred as 'conduits', rightly so. They employ great amount of leverage and are sought of unregulated. Another feature of CDO is layering of securities i.e. while securitizing, various classes of securities are issued – broadly classified as super senior, senior and subordinated ( also called mezzanine or junior notes) and equity (unrated). Super senior (and sometimes senior) bonds are generally rated AAA and subordinated (and senior if there is a super senior) could be anywhere from AA to B and equity tranche is unrated. Yields vary according to the ratings, obviously lower the rating higher the yield. In bankruptcy, losses are allocated to lowermost class and moves up the line as it exhausts, last one being the seniormost bond. The total CDO market in 2008 was approx $2 trillion. These securities were rated by credit rating agencies (S&P Moody’s etc. ), which made it easier for investors as it met their investment requirements. Infact they were generated and tailored such. For originators, as most transactions were being done on non-recourse basis, these got offloaded from their (bank) balance sheets, thereby considerably reducing their risks. The offloading (sale to SPV or another buyer) resulted in upfront profit booking, which proved to be big incentive and tempted them to do more. Originators were able to raise money through this alternative route and showed impressive results as they went on booking profits, and kept impressing stock markets (and their stock prices) which got earned them more incentives. Remember those million dollar bonuses. They repeated the cycle of more origination (pushing more money to consumers), more securitization and more profits. The scale, in trillions of dollars if one adds up all types of collaterals. Later on, though the pools were not as robust, credit rating agencies, an equally big culprit in the game, still assigned high ratings to them, possibly in lure of hefty fees they made. Remember it is seller (who gets securities rated) who was footing the bill and not investor. Investors world over invested in these security receipts in greed of higher yields. In recent years however law relating to securitization has undergone tremendous change. In India, profits cannot be booked upfront and needs to be amortized. Further credit enhancements need to be provided along with the pool. True sale requirements (sale to SPV) have been made stringent. So armed with these concepts lets see what happened. Since the recovery was on the back of asset bubble, it collapsed. When the prices of houses took a knock, correcting by over 40%-70%, the sub-prime segments and other variants started defaulting. As a result, all the securities and CDOs started experiencing cash flow problems. All those bonds and CDOs lost value and organizations owning them (the SPVs, the investors, the banks or hedge funds themselves) started experiencing losses. S&P revealed that, under its new recovery assumptions, any class rated A or lower would likely suffer 100% losses and the losses on AA-rated slices would be 95%. The junior AAA-rated tranches expect to lose 65% and even the riskless super-senior AAA tranches will suffer losses of 40%. Hence securities which only had sub-prime (or it variants Alt-A and other adjustable rate mortgages) pools lost almost entire value and organizations owning them took severe losses and eventually collapsed starting with Bear Stearns. Since these securities are marked-to-market (MTM - in accounting for fair representation these assets are valued by their fair market value rather than book value), they led to huge accounting losses. Due to multiple packaging, questions arose on actual valuation of these CDOs, causing further loss of confidence and value erosion. Investors world over have far taken losses running over $500BN and have led to collapse of investment banks like Bear Stearns, Lehman Brothers and Meryll Lynch, insurance giant AIG, largest US Banks like Wachovia and Washington Mutual, big consumer finance institutions like Countrywide, government backed FIs like Fannie Mae and Freddie Mac (both nationalized). Surviving investment banks lost their identity and has been converted to full time banks with government pumping equity) and many structured investment vehicles evaporated overnight. Citibank was on its knees and was saved by last minute intervention. Rating agencies, S&P and Moody’s, reputation is blown to pieces. Conglomerates like GE are facing heat because of GE Capital. The story is no different in UK, Australia, France, Germany etc. Due to globalization and increased velocity, these securities found its place everywhere. We have talked only about mortgages. We have credit cards and leveraged bank loans which again run into trillions of dollars. As unleveraging continues, the securitized papers will lose value (due to cash flows and MTM) and deepen the crisis. All this has resulted in seizure of financial markets. Loss of trust confidence have sucked out liquidity from the system and brought the financial world to grinding halt. Stock markets world over have collapsed to 1/3rd of their highs. Economies have started contracting. Industrial output is falling. Exports are declining. Margins are going down. Losses are piling up. It has started hurting the real economy ( income, consumer spending, employment etc. ) and is only getting chilling with every passing day. One must remember while equity didn’t give them the upside, the debt needs to be serviced and stands at value. Wealth generated over last ten years has been lost. Millions have been shown pink slips. Probably an attempt to save a milder recession in 2000-01 only postponed the problem leading to a deeper recession. The European economists were right. Joseph Schumpeter, in a 1942 article, argued that recessions are a process of creative destruction in which inefficient firms are weeded out. Only by allowing the “winds of creative destruction” to blow freely could capital be released from dying firms to new industries. Had this been allowed when it was milder, we may have saved ourselves from todays all-engulfing seizure. Lot or learnings for everyone, especially for us as professionals. It will worsen before it gets any better. India is not immune either in this globalized economy. End of the day, philosphy reins in, making money is not bad, making obscenely is. Acknowledgements : The Economist ( Simon Cox & Others), Chicago Fed (Richard Rosen) and Wharton School Publishing ( George Chacko & Others). Since your profile is not available, I want to thank you via a comment here. Thanks for your kinds words and encouragement.